The Allegro story starts in 1962 when the Caneva family opened a music shop in downtown Lockport, called the Lockport Music Center. They sold all types of instruments and taught many of the award-winning band students from Lockport Township High School. The music center went through several changes of ownership over the next 30 years, but it was always a home for young musicians in Lockport. In 1992, Tim Veurink saw an ad in a paper for a music shop for sale. As a teenager, he’d spent many hours hanging out in just such a place, playing guitar and enjoying the “musician vibe.” It sounded like a dreamy business opportunity, as well as a ticket out of his current line of work—accounting, ugh. So Tim walked through the door of Lockport Music and was greeted by a kindly, older gentleman. Tim said to him, “This is a nice place you’ve got here.” And the man responded, “Yes it is. You want it?” And several conversations later, Tim owned a music store. Dreamy! Tim continued the grand tradition of the Lockport Music Shop—lots of hanging out, playing guitar, and soaking up the vibe. They sold guitars, amps, musical instruments and accessories, and they taught a lot of lessons. But in truth, there was more hanging out than actual sales. Tim kept working at it, in spite of Big Music Stores and the rise of the internet. But the landscape for retailers was changing, and Tim was ready for a change too. 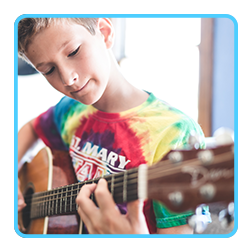 In 2001, Tim found himself in a conversation with a local piano teacher, Lori Gardner, about the lesson business in Lockport. Lori’s dream was to start a performing arts academy in neighboring Lemont, where most of her student base was located. Tim liked the idea, and they decided to make it a partnership. On September 11, 2001, while the reports of airplanes slamming into the Twin Towers in New York were coming over the radio, they were just starting the remodeling project in an old building in historic downtown Lemont. It was an emotional day. Over the next month, they hung drywall, painted, bought furniture and pianos and toys, until the space was perfect. The Allegro Music Academy was now a reality. On October 23rd of 2001, Lori taught their first lesson. They were fortunate to meet many great families that wanted to learn how to play music. These families told their friends, who told their friends, and the word travelled fast in the friendly town of Lemont. Soon more space was required to accommodate the growth, and they were able to rent the 2nd floor of the building to add additional teaching studios. Lori had become a very expensive business partner, so Tim decided he was either he was going to buy her out or get her to marry him. Since she’s the reason the studios are so much fun, he chose the second option. Luckily for him, she said yes! In August 2003, they made it official in a small ceremony at Dellwood Park in Lockport. Like lots of things in marriage, Tim found himself agreeing with Lori’s ideas more and more. Allegro was proving to be a big hit in Lemont and they knew it was time to continue growing and teaching more students. Ever since the Europeans sailed in search of the new world, humans have been westward focused. Allegro is no different apparently, and so they looked to Bolingbrook for the 3rd location. In May of 2006, they moved into a cozy little strip mall space on Boughton Road and launched the third studio, which for the first time also included a dance program. 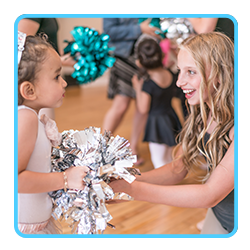 Allegro Music and Dance Academy became the new name as they moved closer and closer to Lori’s dream of having a performing arts academy. In three years’ time, they outgrew that little space in the strip mall and considered a completely different option for the studio—they now share space with Westbrook Christian Church on Lily Cache Lane, which also happens to be Tim and Lori’s home church. This space has rapidly grown into a wonderful home for lots of new students and their families from Bolingbrook, Plainfield, Naperville and Romeoville. Today, the dance studio is thriving, but only in the Lemont studio, due to space constraints. However, the past has proven that you just never know what might happen next! 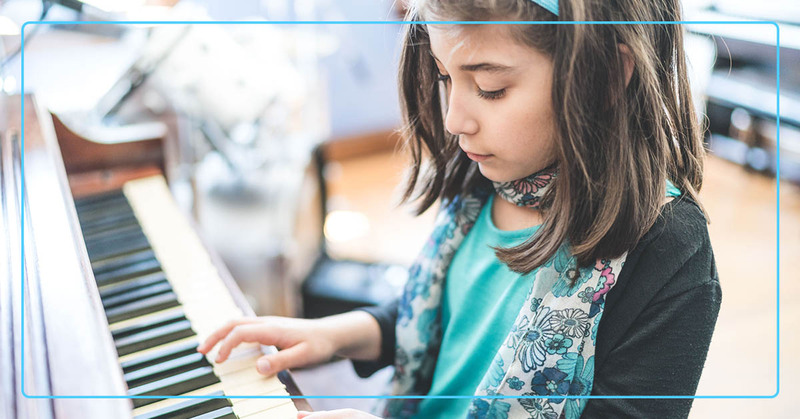 Through it all, our goals remain the same: We want to teach music, dance and other performing arts to everyone we meet. We still want to be a welcoming place where students of the arts can meet each other, study, hang out, perfect their craft and then perform onstage for a crowd of adoring fans. How cool is that? We consider our students, teachers and staff to be part of our family– the Allegro family. And guess what? There’s still room in this big crazy house… should we set a place for you?